DOON, Iowa (AP) — An estimated 230,000 gallons (870,619 liters) of crude oil spilled into floodwaters in the northwestern corner of Iowa following a train derailment, a railroad official said Saturday. BNSF spokesman Andy Williams said 14 of 32 oil tanker cars just south of Doon in Lyon County leaked oil into surrounding floodwaters from the swollen Little Rock River. 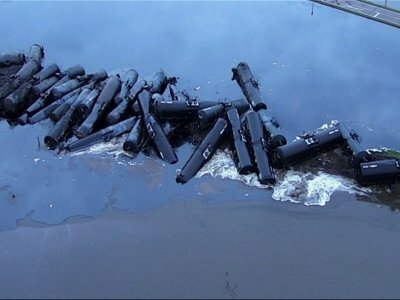 Williams had earlier said 33 oil cars had derailed. Nearly half the spill — an estimated 100,000 gallons (378,530 liters) — had been contained with booms near the derailment site and an additional boom placed approximately 5 miles (8.05 kilometers) downstream, Williams said. Skimmers and vacuum trucks were being used to remove the oil. Crews will then use equipment to separate the oil from the water. “In addition to focusing on the environmental recovery, ongoing monitoring is occurring for any potential conditions that could impact workers and the community and so far have found no levels of concern,” Williams said. Officials still hadn’t determined the cause of Friday morning’s derailment, but a disaster proclamation issued by Gov. Kim Reynolds for Lyon and three other counties placed the blame on rain-fueled flooding. Reynolds visited the derailment site Saturday afternoon as part of a tour of areas hit by recent flooding. Some officials have speculated that floodwaters eroded soil beneath the train track. The nearby Little Rock River rose rapidly after heavy rain Wednesday and Thursday. A major part of the cleanup work includes building a temporary road parallel to the tracks to allow in cranes that can remove the derailed and partially-submerged oil cars. Williams said officials hoped to reach the cars Saturday. The train was carrying tar sands oil from Alberta, Canada, to Stroud, Oklahoma, for ConocoPhillips. ConocoPhillips spokesman Daren Beaudo said each tanker can hold more than 25,000 gallons (20,817 imperial gallons) of oil. Beaudo said Saturday that the derailed oil cars were a model known as DOT117Rs, indicating they were newer or had been retrofitted to be safer and help prevent leaks in the event of an accident. This story has been corrected to show that 32 oil tanker cars derailed, not 33.